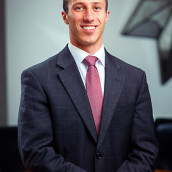 Bryant M. Greening has dedicated his career to fighting for the rights of injured persons. Bryant has extensive experience as a Plaintiff’s attorney in Illinois and Federal courts. Throughout his career, Bryant has secured millions of dollars for clients through trial verdicts and settlement negotiations. Bryant earned his Juris Doctor from DePaul University College of Law and Bachelors of Science from Ohio University – E.W. Scripps School of Journalism. Bryant is licensed to practice law in Illinois and is a member of the Federal Trial Bar for the Northern District of Illinois.